It’s that time of year again! There are so many great Women’s History Month activities– reading the 19th amendment aloud in front of a crackling fire, going to the mall to sit on Susan B. Anthony’s lap– that it’s easy to get overwhelmed. It’s important to remember the true purpose of the season: coming out to support your local Women’s History blog! So why not attend one of our upcoming programs? Pioneering Missouri Women — Missouri State Museum (in the State Capitol), Jefferson City, March 12, 1:30 pm. This tour of the capitol will leave from the tour desk. Call 573-751-2854 for more information. 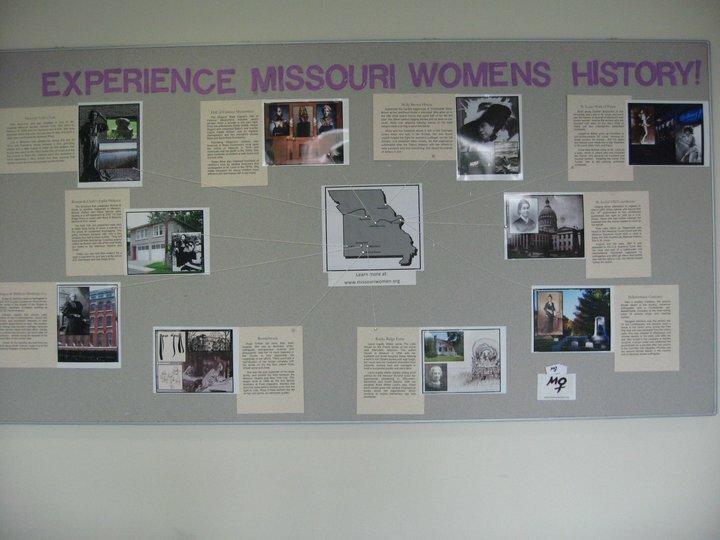 Women’s History Tour of MSU — Missouri State University, Springfield, March 15, 12:30 pm. This tour of the MSU campus will begin in Craig Hall. Call 417-380-8749 for more information. You can also stop by the MSU Campus and see the Missouri women’s history exhibit we installed on the second floor of the Meyer library. It’ll be up all March. Or just check out the web version. And if you’d like to see some of the other Women’s History Month activities going on throughout the state, visit our events page. When I sat on Susan B. Anthony’s lap and told her what I wanted for Women’s History Month, she slapped me and told me I had enough already.